I told Marilyn I would be extremely sad this week because we are going into our last couple of days of the trip because it has gone by so quickly. I think I could explore England for well over a month and still want more. Terry and I will definitely need to put a long trip here on our bucket list! We have been blessed with excellent weather and I am happy to report I have not once used my “brolly” (umbrella), raincoat, vest, or hoodie. A top and lightweight blazer and scarf have been perfect each day and I am grateful to God for the lovely weather. It’s late and tomorrow is a full day, meeting very early, so I need to be brief. Apologies to both of my readers. 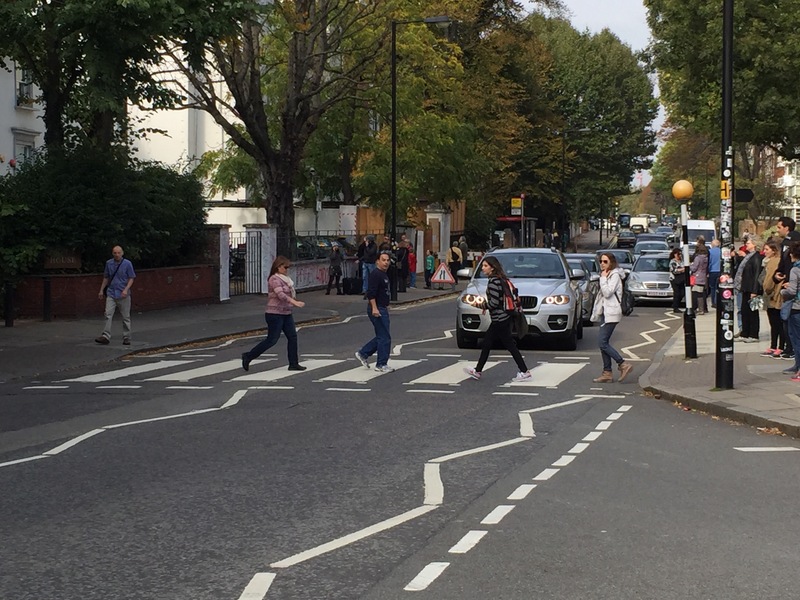 Today we had a coach tour of Beatles locations around London, including walking across Abbey Road. Marilyn was prepared and wore a shirt that stood out a bit so she should be easily spotted on the “Abbey Road cam” shots! We saw Paul McCartney’s home (no, we weren’t invited in) and Tony Bramwell had plenty of stories about the old days he hung out with the Beatles. He is an interesting man and very kind and patient to answer the many Beatles questions that come his way. There was a shout out about Rod Stewart as we drove by the recording studio where he recorded his first album. An afternoon tube trip to Portobello Road/Market and Harrod’s was well worth the effort and I was able to find several goodies to take home. In the evening, 9 of us went to dinner at an Italian restaurant several blocks away. Our table had appetizers of shrimp and calimari; I had a delicious lasagna while my tablemates had spaghetti with shrimp and mushroom risotto. Hearing stories over cappuccino and tiramisu was definitely a wonderful way to spend an evening. Marilyn was looking forward to a quiet evening “in” and an early bedtime, so she stayed behind and was asleep when I got in. Tomorrow will probably be our longest day, so I know she will be glad for the extra rest! Jet lag affects everybody differently and it is no fun, for sure! About the time you get adjusted to your surroundings, it’s time to return home. The up side of a tour is that you see and do a LOT in a short period of time. The down side is…predictably…that you see and do a LOT in a short period of time. It is exhausting and exhilarating all in one. The group continues to be so much fun, with lots of promises of staying in touch. Everybody looks out for each other. The guys are quick to offer a helping hand if needed and are constantly looking out for “us girls” on the trip. It takes away some of the stress of “What if I get lost? !” when you know you have nearly a dozen others to look for. Picture time! Marilyn’s crossing pic is on her phone but I think she got it posted to Facebook. We all crossed several times, trying for the perfect picture. Locals are not always amused, though most don’t seem overly annoyed unless someone stops in the crosswalk to really stop things up. I’m officially tired now so I think I’ll call it done. I like having a “rest” day or “free time” worked into a tour schedule. Sadly, that’s not always possible. I’ve enjoyed reading about your adventures! Thanks! We are having fun!!! Thanks for sharing! I am an old Beatlemaniac friend of Marilyn’s. So glad you guys did this and could share your fun adventures. Wish I was brave enough to fly. But seeing pictures you took and sharing your experiences was awesome to see. Pamela, glad you got to follow along! I dropped off blogging the last couple of days because they were long days. I think I averaged 5 hours sleep the whole trip.